The Coach House in Three Holes, near Wisbech, Norfolk sleeps 12 people. 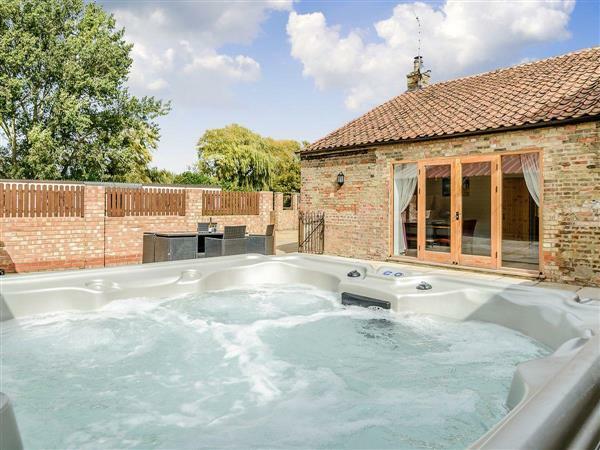 The Coach House near Wisbech is a six-bedroomed barn conversion which is perfect for family holidays, and with a hot tub to enjoy, as well as a large garden area and private courtyard, it provides a great base from which to explore Norfolk. From the moment you drive over the small bridge, you will know you have made a great choice for your holiday. The Coach House has been sympathetically renovated and furnished to provide a warm welcome for guests. It offers accommodation over three floors, including a bedroom with en-suite wet room and a separate bathroom on the ground floor, with five further bedrooms and four bathrooms spread over the first and second floors. For those wishing to explore, the area offers a wealth of places to visit - the cities of Cambridge, Ely, Kings Lynn and Norwich are all within easy reach. The university city of Cambridge has much to offer, including the famous Fitzwilliam Museum, along with lots of guided tours of the colleges and universities, as well as punting trips on the River Cam. Close to Cambridge is the Imperial War Museum, while Duxford is well worth a day out, too. Ely, with its imposing cathedral, named ’The Ship of the Fens’, is a small, bustling city that also boasts a stained glass museum and Oliver Cromwell’s House. The Hanseatic port of old Kings Lynn is a popular destination, as is the medieval city of Norwich with its fine Norman castle. Those wishing for quieter pursuits will enjoy the Welney Wetland Centre; within an hour beach lovers can be on the Norfolk coast, and history lovers can be at the Sandringham Estate. After a busy day, you can either retire to the peaceful garden or stoke up the fire, and relax and unwind while planning your next adventure. The beach is 30 miles from The Coach House near Wisbech. With the shop 2 miles, and the pub & restaurant being 4 miles from The Coach House. The Coach House can be booked together with Lode Hall (ref W44296 [Lode Hall]) to sleep up to 20 people. Living room: With wood burner, 55 Freeview TV, DVD player, soundbar and laminate floor. Kitchen/dining room: With electric oven, gas hob, microwave, fridge, freezer, dishwasher and laminate floor. Bedroom 1: With king-size bed, Freeview TV and en-suite wet room with shower and toilet. Bedroom 2: With super king-size bed, Freeview TV and en-suite with shower cubicle, toilet and heated towel rail. Bedroom 3: With super king-size bed, Freeview TV and en-suite with shower cubicle, toilet and heated towel rail. Bedroom 4: With king-size bed, Freeview TV and en-suite with shower cubicle, toilet and heated towel rail. Bedroom 6: With twin beds and Freeview TV. Gas central heating (underfloor in living room, kitchen and en-suite wet room), electricity, bed linen, towels, Wi-Fi and logs for wood burner included. Travel cot, highchair and stairgate available on request. Welcome pack. Large lawned garden. Enclosed courtyard with patio, garden furniture and barbecue. Private parking for 6 cars. Hot tub for 8 (private). No smoking. Please note: There is a roadside ditch, 55 yards away. Holidays at The Coach House run from Friday to Friday. The Coach House is in Norfolk; should you be on the lookout for a special offer, you can find all the special offers in Norfolk. It's always worth checking to see what is on offer at the moment. Do you want to holiday near The Coach House (UKC1840), you can see other cottages within 25 miles of The Coach House; have a look to find your perfect holiday location.